That's right, folks, two stalls, no waiting. And, believe it or not, it's even hooked up with electricity! No fumbling around in the dark. I don't know if "Ma's" side features a mirror and plug-in for electric curling iron and such devices or not. 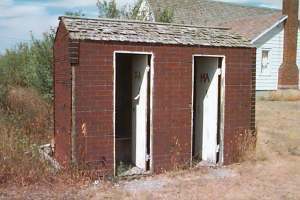 Well, that concludes our tour of the Outhouses of Downtown Pendroy. If I've missed any, be sure to let me know!